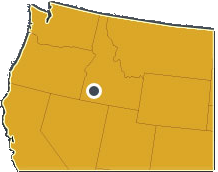 The Company’s principal assets are the South Mountain historic base and precious metal project, currently being developed through a Joint Venture, and located on private land in southwestern Idaho. The second asset is the Trout Creek Project — a grass-roots disseminated gold target in the Eureka-Battle Mountain trend of central Nevada, currently under Joint Exploration Agreement with Newmont USA Limited. Thunder Mountain Gold – OTCQB: THMG and TSX-V: THM – is a precious metals explorer, both actively and aggressively focusing on developing high-quality precious and base metal projects in North America through acquisition and grass roots exploration. Our expertise is generating premier precious and base metal projects in the Western United States that will one day become producing mines. Founded in 1935, Thunder Mountain Gold performs its own natural resource exploration and generates value for shareholders by aggressively developing high-grade, high-quality precious and base metal resources in politically stable mining regions at low costs. Thunder Mountain Gold has real management, with real properties, and is committed to environmental stewardship at all of their projects – conducting all activities with the utmost ecological care and compliance with environmental regulations. Larry Thackery2019-02-28T11:07:10-06:00February 28th, 2019|Comments Off on THUNDER MOUNTAIN GOLD INC. SIGNS AGREEMENT WITH BEMETALS CORP.